Every month we gonna do a feature on a member and his/her car. The winner of the specific month will recieve a photoshoot by myself, his/her car will appear on the forum homepage & we will post a full on feature of you and your ride on this site & facebook. It's simple, just reply to this thread who you think deserves the members ride of the month award. Your decision will be based on looks, what mods the owner has recently done to make it worthy of a feature or even just how the owner keeps it neat and clean. PLEASE NOTE ONLY FORUM USERS HAS THE ABILITY TO VOTE, IF NOT ON THE FORUM, NO VOTE!!! YOU CAN NOT VOTE FOR YOURSELF! PLEASE OWENS, LETS GIVE SOME PRIDE TO OUR FELLOW DUBBERS AND GIVE THEM RECOGNITION FOR THEIR MODS AND MK1'S. I'll start off by casting the first vote. This month i will have to say Mr. Muscle himself, Imtiaaz. Very subtle mods has been done to his ride but it gives that edge it needs for people to go YOH! And he keeps the car damn clean bruddahs! AGREED!! I Vote a YES YES YES!! 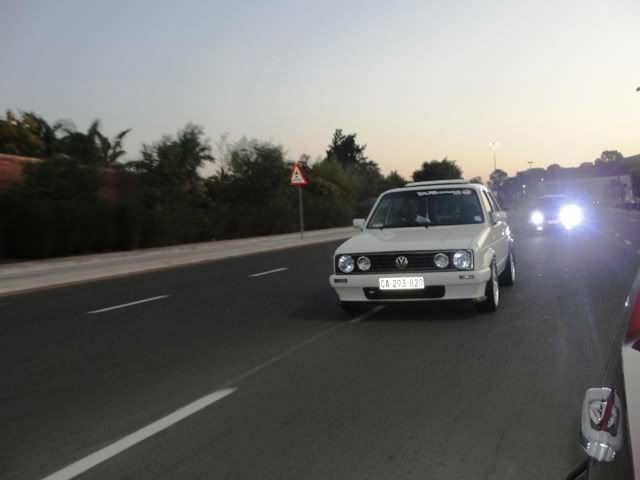 Definitely the White Dub with the dakkie.....nice one! Three votes so far for Immie! VOTING CUT OFF IS TONITE @ 00:00AM. Here's a sneak peak of Immie's ride, it's a rolling shot and looking HOT!!! Looks like our Members ride of the month July/August goes to IMTIAAZ. Feature will be posted soon. LOL i cud only find it n0w!! But its 2late 0redy, but im stil v0ting 4 Immie!! lol, me to!!! but ima vote for immie 2!!!! you guys mos know this forum is completely new, so we need to build a strong database of users by incresing the activity on the site. so this Members Ride of the month section is gonna get real busy soon. so this Members is gonna get real busy soon. ja i just checked out the member list!! joh but its growing!!! i like i like!!! People & other clubs really givin us big ups on how fast we entereing the scene ne!!! BIG UP to all other clubs!!!! Most definitely shot for the support!!! ouens i think he shed a tear on that one!!! seems like mr. muscle does have a soft side!!!! i'm going to do your shoot at our members meeting on the 31-07-2011 so i can feature your car for august. So make sure its clean. I will do a feature on you soema via e-mail. i will send you the q's and you can just reply. Ok, New month coming up, new homepage pic needed. So, the voting starts again.................!!! This month im going to vote for...................OUPA RIYAAD!!! Loving the stance this man has and the out of the box mods.......and the cleanliness!! !